On the 'most wanted' list of many guys this year are these leather hi-tops from Rick Owens' spring/summer 2008 collection. However, the $1,200+ price tag can be a little hard on the wallet, so, a lot of guys turn to eBay and other online sources in search of a bargain. 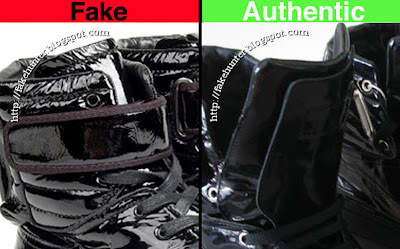 Because Rick Owens is more of a niche label, unknown to the average Joe on the street, people often assume it isn't faked. 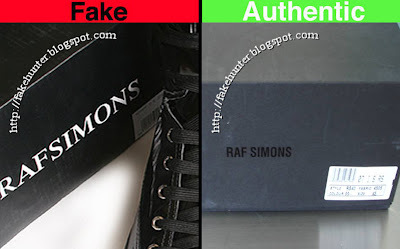 Well, there are knock-offs of just about every label out there, and the more underground the label, the more money the counterfeiters can get for the fakes, simply because people assume they're real. 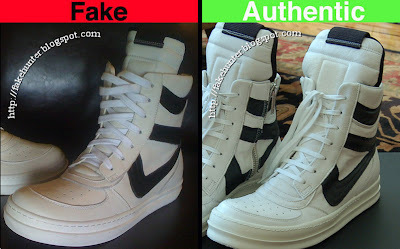 They don't look bad at a glance but the fakes are, of course, poor quality and not worth the $200-600 they sell for. The real ones should last you a lifetime. In this first photo you can see the difference in the sole, the shape of the toe, and the shape and distance between the stripes. Also, note that the authentic shoe has thinner laces. Here is a close-up of the toe. You can see how the rubber part of the sole is molded differently. 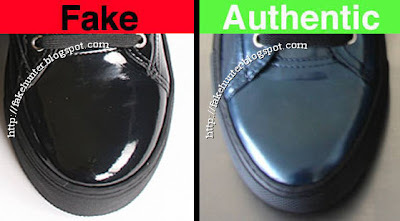 The cap of the toe on the fake recedes farther back than the authentic one. This detail shot of the side illustrates the difference in the quality of the stitching. 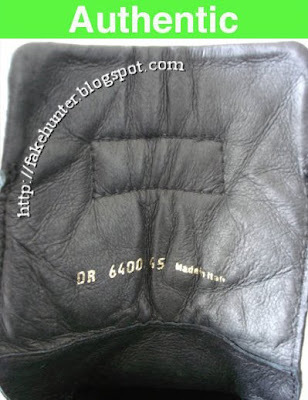 Note how some of the fake's stitches are different sizes, and how they don't follow the curve of the leather very well. 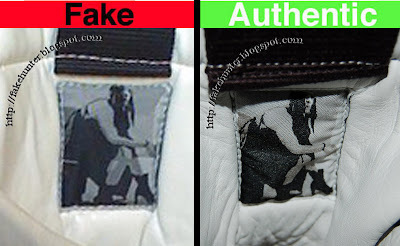 You can also see how the stitched rectangle is more squared and shifted on the fake shoe. 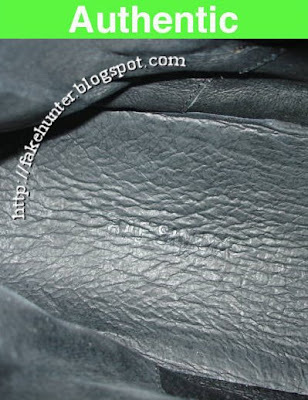 There are also variances in the shape and proportions of the leather pieces throughout the shoe. 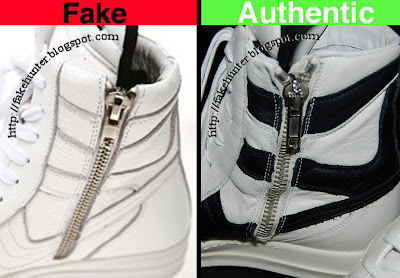 The authentic kicks have a silver zipper vs. this fakes' copper colored zipper. The zipper itself is also a different shape. The real one is a bit longer and skinnier. The size should be printed on the leather flap inside the zipper (in this case they are a euro size 42). 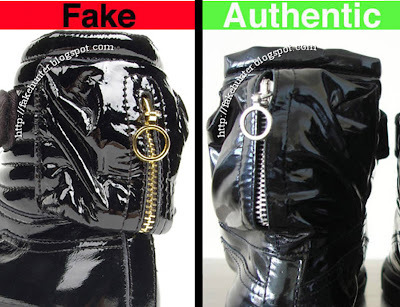 There are different varieties of fakes out there, the one above does have a silver zipper but it doesn't have the correct toggle. 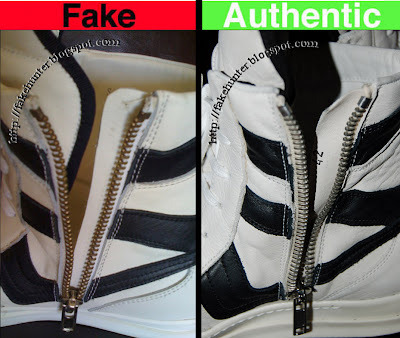 The fakes tend to use cheap hardware (such as generic zippers). Sometimes they mold their own but it is usually a very poor casting. In this comparison you can see the difference in the shape of the toggle better. This is the patch on the back side of the tongue. Compare the width of the patch to the black tab above it in the first set. The real tab is wider than the patch. However, some fakes are correctly proportioned, as demonstrated in the second set. In both examples the stitching across the black tab varies from the original. Last, but not least, the insole. Notice a difference? Yeah, you guessed it, they didn't bother to stamp the Rick Owens logo in these fakes, which makes it a little easier to export them without alerting customs agents. The real ones also have a serrated edge along part of the insole. Gucci is one of the most commonly faked labels, everything from socks to suits has been counterfeit. 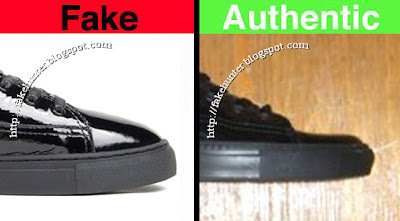 A lot of the Gucci fakes are very poorly done and obviously fake. Gucci is one of those mega labels that sustains a strong consumer base interested solely in the logo (see also Louis Vuitton and Chanel). The hip-hop culture of the 1980's embraced blatant fakes as a sort of satire. For many it was about a parody of the wealthy who chose to flaunt their designer logos, and it was about challenging their affluence, or at least how the rich portrayed it. It was a way of demystifying the appeal of two interlocking G's or C's, or an 'LV.' It was about showing the logo for what it is; a marketing tool, used invoke specific imagery and a sense of membership. Perhaps a bit ironically, the mainstream hip-hop culture of today has bought into the very cache it was mocking twenty years ago. 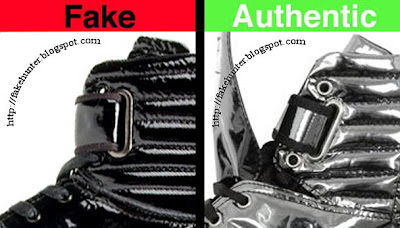 There are many varieties of Gucci fakes, some are obviously fake, and some are copied quite well. If you buy Gucci online from a secondary source such as eBay, pay close attention to my tips in the 'Hunting Basics' section of this blog. Over the years Gucci labels have changed. When Tom Ford was the head designer the labels and font were larger (as seen in the first example below). I think it was in 2005 that they changed the shirt labels from the rectangular shape to the longer and skinnier shape with smaller text (as seen in the fourth comparison example below). In the above comparison you can see the difference in the size of the lettering, both on the label and on the size tag. The difference is subtle, which is why it's important to look closely at the pictures when you're buying online. This is a Tom Ford-era tag, which is taller than the current tags. The two examples above are rather obvious fakes. The first one is proportioned totally wrong, the Gucci text is wrong, and the size tag is wrong. In the second example the tag is gold, and there are no gold Gucci tags. Unless we're dealing with vintage Gucci, the label should be white text on a black label. The marked size (in this example 'M') should not be on the same label, it should be on a separate piece of material either sewn to the label or elsewhere on the shirt depending on when style shirt it is. 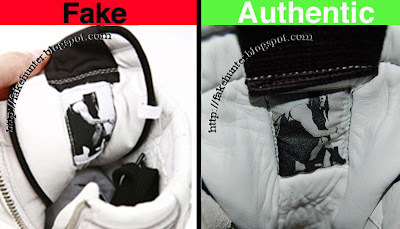 In the above example the fake tag is missing the 'Made in Italy' text. These examples are all of pretty decent fake labels. You have to click the pictures to enlarge them to see the variances in the text. The text in both of the above fakes is too bold, and the stitches don't form smooth rounded letters. Also note that the spacing between the 'Made in Italy' and the 'Gucci' text is greater in the authentic label.